Neon has been HUGE this summer and although summer is almost over, you still have time to sport this trend. Here’s a video tutorial where I show you 3 different ways on how to make a super cute neon shirt using fabric spray is less than 5 minutes. Enjoy! 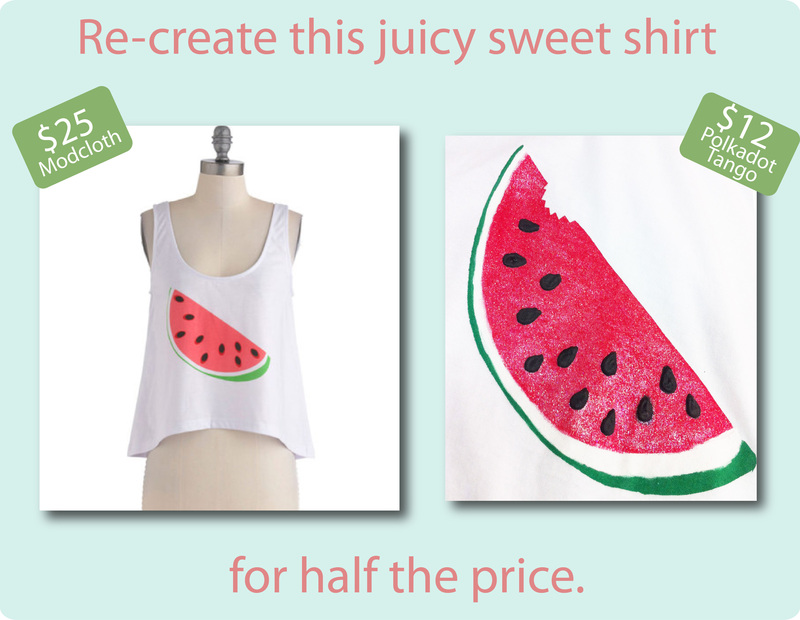 I recently came across this super cute watermelon shirt while browsing through an e-mail I received from Modcloth. As much as I was tempted to just hit the “add to bag” button, I thought not only do crop shirts look ridiculous on long torso, but I can easily create my own version of this shirt. And with the summer season quickly coming to an end, that can only mean one thing, end of season sales. Right now my favorite tank tops from Target are only $5.00 and with about $7.00 worth of fabric paint products, I easily created this shirt for half the price. 1.Start by drawing a the watermelon slice to the freezer paper, which is pretty much a half oval. (I added bite marks to mine). 2.Then cut the image out of the freezer paper to create a stencil. Iron the freezer paper (shiny side down) onto your shirt until it adheres to the shirt. 3.Start by using the Holiday Green paint, starting out with a thinner line of paint at the top and gradually making it larger. 4.Now for the next part, you can either use the white of your shirt or the Glacier White paint to make the 2nd layer. 5.Fill in the rest of the watermelon stencil with the Scarlet Pearl paint. 6.Once dry, peel off the freezer paper stencil and walla, you have a watermelon! 7.Next use your Puffy Black paint to create the black seeds. Scatter as you please. 8.Once this paint is fully dry, you can use a steamer or your iron(when turned to steam mode) to puff up the black seeds. (See bottle for instructions). A Cup of Motivation For You!